Time to spread the word! Kia have launched their first all-electric, zero-emissions car to be sold in the UK, the Soul EV. Great for all of us green aware trend setters! The challenge for this gig was to turn the rather small space into a zero distraction immersive experience, kudos to the design team! It was great to work with OTM, as a creative agency they were professional and lateral thinking. 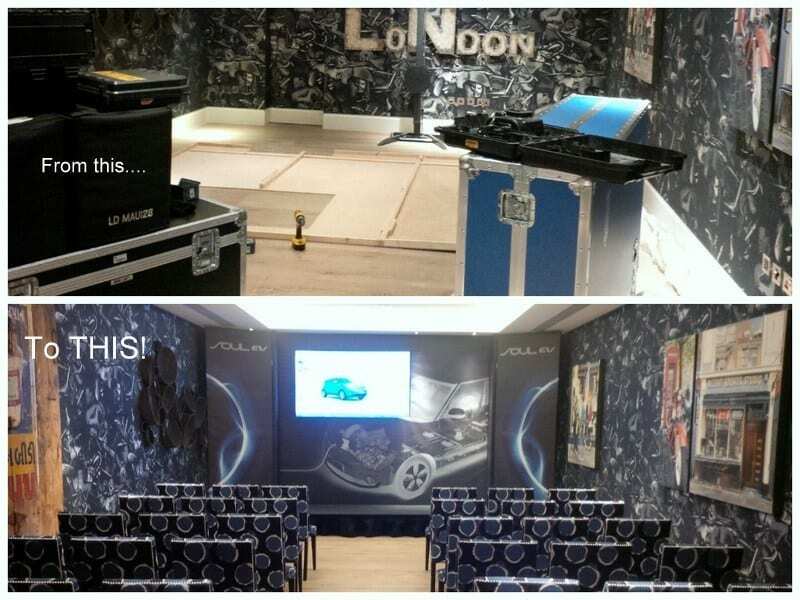 The solution; a fully enclosed bespoke stage and set to house the 75” LED Display and PA system. For three days, presentations were hosted for the automotive press market getting the message out, “Soul EV makes charging easy by plugging into any standard 120v outlet or a conventional 240v EV charger”. No more excuses to not go electric. Meanwhile, we do what we do best, transforming the space using audio visual solutions to effectively deliver the client’s message.